Home / Fanboying! / CB and Scotty Get Kemper-Ized At A Bridesmaids Q and A! 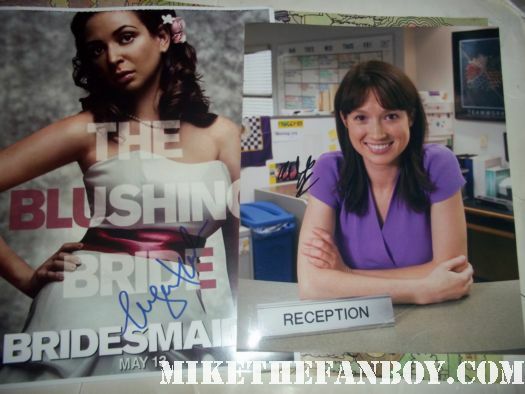 With Maya Rudolph! Wendi McLendon-Covey! And… AND… ELLIE KEMPER! Check out the report from the Bridesmaids Q and A after the jump! I’m pretty stoked for today because Mike told me about a Bridesmaids screening followed by a Q &A today. My first question was, “IS ELLIE GOING TO BE THERE”. I’m going to say it, I love me some Ellie Kemper so this write up could be VERY biased! Bridesmaids was a great movie, and I had fun at the premiere earlier this year. I actually reviewed the movie and told everyone to go see it because it was different than what Hollywood usually puts out. It came out around Fast Five which Mike BANNED me from reviewing. I enjoyed the movie and the whole cast couldn’t be nicer after the movie ended. Since I already had the cast, I had individual photos I printed that were left unsigned. (I forgive Ellie for not signing when only three of us were calling for you). 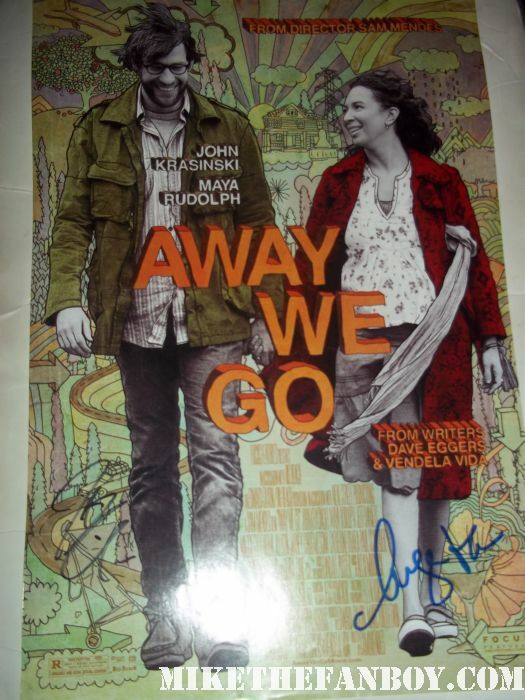 I also brought my “Away We go” mini poster for Maya Rudolph that already has John on it. Here is hoping for the best. 8:30: I arrive and am joined by Scotty the Music Man. He needs Ellie on his poster. 9:00: First one to arrive is Wendi McLendon-Covey who couldn’t be nicer! I had this old photo and she signed it and then took a photo with me. She’s really nice and I mention how much I loved RENO 911. She says, “Thanks”. 9:10: Next arrival is Maya Rudolph, who once again, couldn’t be nicer. She signs and then says I have to go. I get her on my Away We GO Poster. This is after she is running late…..SO NICE! 9:15: Paul Feig the director arrives, but we don’t ask him to sign. 9:20: No sign of Ellie Kemper, we spot someone who resembles her, but I’m positive it isn’t her. One of the other people says that’s her, but I have my doubts. 10:00 The Q&A ends and we spot the cast leaving. I see ELLIE! She’s busy talking so I go ask Maya for a photo and she obliges. I get her to sign the individual photo and she’s really nice once again. Finally Ellie signs, but its quick, then she leaves. Luckily I get her, but Scotty doesn’t! What can I say, thank you Ellie Kemper! I had a great time and everyone was cool about it. Wish more events were like this. Take care everyone. 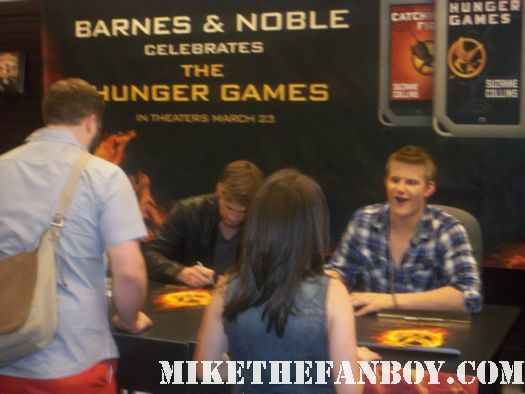 CB Checks Out The Hunger Games Book Signing! And Meets Liam Hemsworth! Alexander Ludwig! Amandla Stenberg! Autographs from Gale! Cato! and Rue! Billy Heads To Paris! Paris Hilton That Is! He Meets The Diva And Joins The Bling Ring! Autographs! And More! The Lost City Of Z Q and A! Meeting Tom Holland! Robert Pattinson! But Missing Charlie Hunnam and Sienna Miller! Doh!